Michel Bras Toya, located in the Windsor Hotel Toya, has become a must-visit restaurant for those who want to sample the finest French cuisine in Toya, Hokkaido. 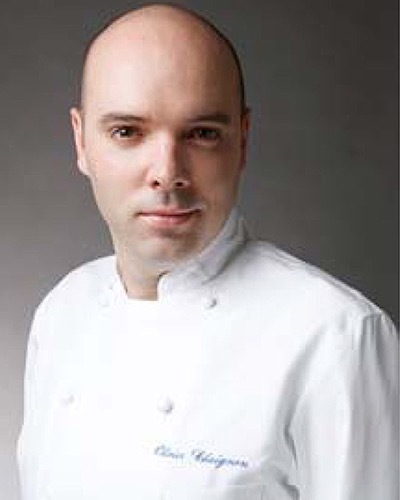 Simone Cantafion, the chef and director of the restaurant, continues to showcase the heart and soul of Michel Bras’ cuisine in each dish, complemented with local Japanese seafood and produce. Patrons often find themselves completely seduced by the breathtaking view of Lake Toya, the flawless and attentive service and, most importantly, the stunning food, presented with the attention that might be devoted to a piece of fine art, with flavors to match. As much of a culinary shrine as a fine-dining destination, this restaurant has been operated by the Troisgros family since 1957. 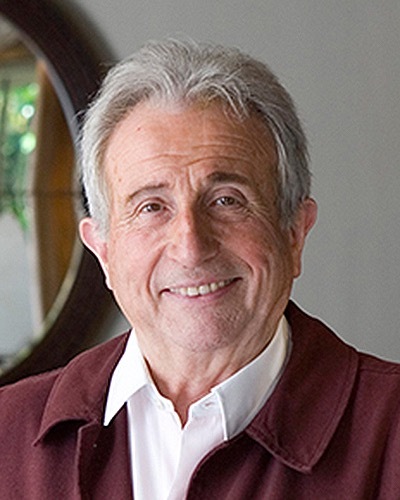 Michel Troisgros practices a style of cooking known as cuisine acidulée. But regardless of whether you are pursuing one of his creations, or one of the house classic dishes that date from his father's reign as chef, or a bottle from one of the best and most fairly priced wine lists around, it is well worth making a special trip to this hotel/restaurant an hour east of Lyon. 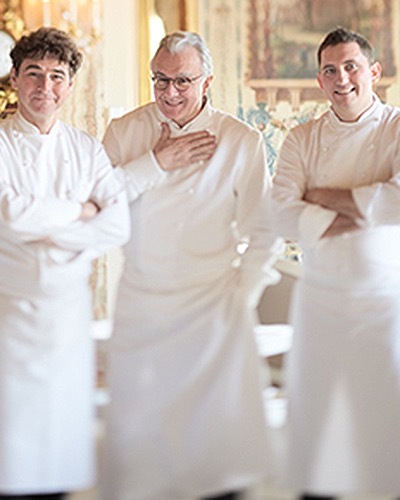 Local fish that has arrived in port that morning and vegetables that have been bathing in the Provençal sunshine until they are ready to be picked are just two of the reasons to visit Alain Ducasse's opulent dining room in Monte Carlo's Hôtel de Paris. The amazing bread and cheese carts, and a wine list that is packed with more cherries than a tart, are a few others. People say the best time to visit this modern hotel/restaurant located just north of the Ardèche is at the height of the mushroom season, when you can enjoy the all-mushroom tasting menu that Regis Marcon and his son Jacques offer their guests in all its glory like a mushroom tea flavored with tansy flowers served with ravioli stuffed with Burgundy truffle.The wine list is likewise glorious and features cherries from producers like Raveneau and Dujac. Reviewers say this kitchen, overseen by octogenarian Michel Guérard, a founder of the nouvelle cuisine movement and the inventor of the belt-tightening cuisine minceur, can still cook with the best of them. 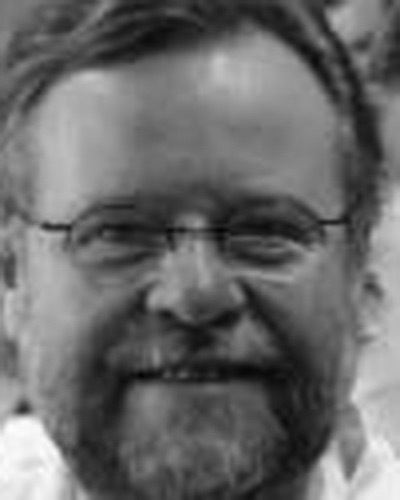 May we suggest that you pay his hotel/spa a visit while you still have an opportunity to experience his “spare, simple and highly terroir-driven” cuisine? Her daughter and grandson now do most of the cooking at this classic house in a remote part of Lombardy, but the majestic Nonna Bruna still visits the restaurant's kitchen on a daily basis to make sure the brodo that the tortellini is served in is perfect. 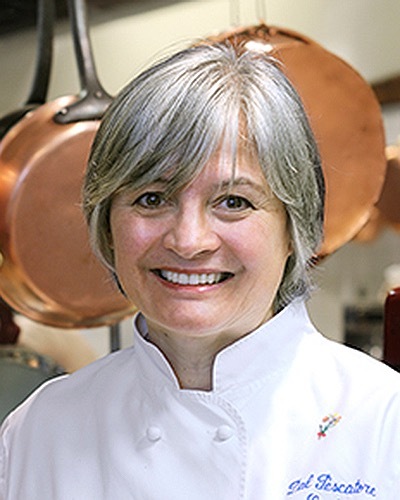 We assure you that if you are lucky enough to sample her cooking, you will want her to adopt you. The restaurant’s name translates to “house in the Black Forest.” Those fortunate enough to have ventured into the heart of the forest in order to sample Harald Wohlfahrt’s German take on haute cuisine will understand why a long line of talented young chefs began their careers in the kitchen of his wonderful restaurant. It is located in a luxurious hotel and spa, and those who have spent the day working on their physiques often opt for Wolfhart’s 10-course vegetarian tasting menu. 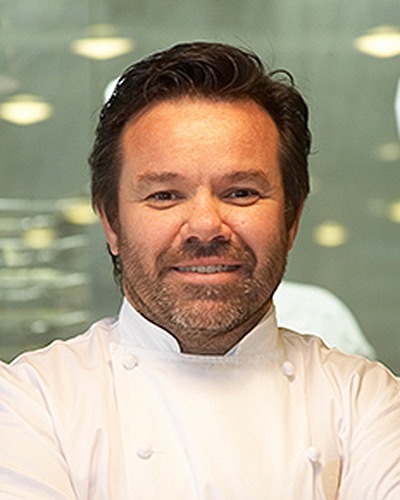 Getting on in years and in the process of turning over his pots and pans to his son Mathieu, Bernard Pacaud is known for being a fanatic about ingredients and a perfectionist in the kitchen. Serious diners continue to flock to this restaurant in Paris's Place des Vosge in order to enjoy some of the most precise traditional French cooking in the world. The word "grand" can be easily applied to every corner of Robuchon Au Dôme, even to the hotel it is located in, as it is situated at the circular dome of Grand Lisboa Hotel. From the ultra-high ceilings, gold color cladded furniture, crystal chandeliers and full window view of Macau, giant bread and dessert trollies; everything about this restaurant is designed to impress. The food is as luxurious and extravagant as the setting, and there are no shortage of dishes featuring caviar, foie gras, truffles and langoustines on the menu. 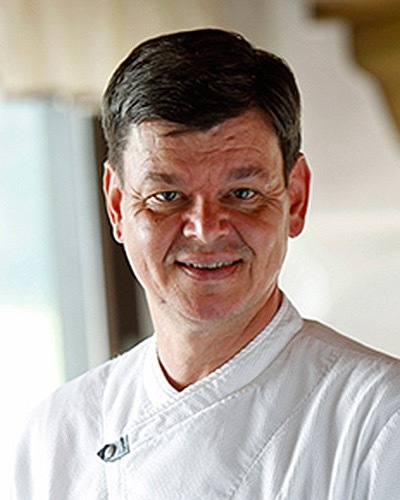 You will also find many of Robuchon’s classic dishes, such as sea urchin with lobster consommé jelly and cauliflower cream, or roast pigeon served with Robuchon's famous mashed potato. And you can top it off with one of the most impressive wine cellars in Asia, if not the world. Given the restaurant’s location, the clientele comes from every corner of the world for what is clearly a splurge meal for most people. However, during the day they offer a very reasonably priced menu, resulting in seats at lunch being highly sought after. It’s difficult enough running one of the top restaurants in the country, let alone two restaurants in the Top 20 . . We could allot this entire review to writing about Keller’s signature dishes, which include Oysters and Pearls, truffle custard with black truffle debris, cauliflower panna cotta topped Ossetra caviar and many others. But beyond the lengthy list of creations, what makes the French Laundry so special is the second-to-none attention to detail that the restaurant has exhibited since the day it opened. It’s wildly popular with some of our reviewers, many of whom make annual pilgrimages and nearly two-thirds of the people who reviewed the French Laundry traveled from outside California order to eat there. We even had one reviewer who wrote of having paid more than 40 visits to the restaurant. 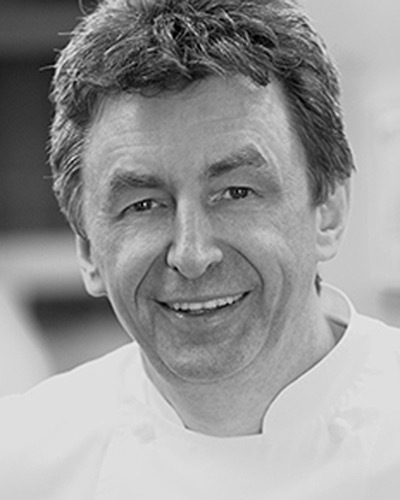 Helmut Thieltges is the quiet star among Germany's top chefs. 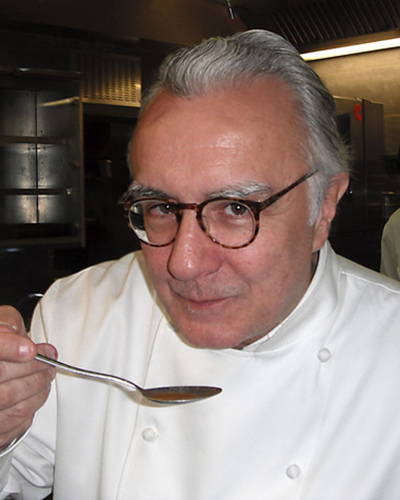 He never worked at fancy restaurants or chased fame and fortune, instead spending his time developing his own cuisine— classic, but never boring—which stands out for its product quality and precision cooking. Diners can expect signature dishes that are unforgettable. 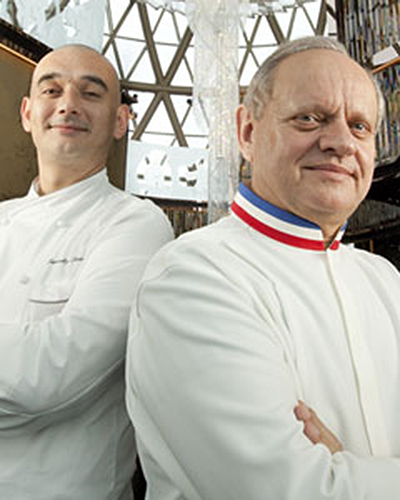 One of the most iconic French restaurants in Tokyo, Château Restaurant Joël Robuchon has been serving high-quality French cuisine here since 1994. Starting with the castle-like exterior and luxurious décor, it goes on to dazzle diners with every detail and impresses them with extravagant and pristine ingredients, prepared in meticulous fashion. The classic Robuchon dishes are served here, along with new ones incorporating the finest Japanese produce, seafood and meat. This is one of the most expensive French restaurants in Tokyo, but well worth the price. 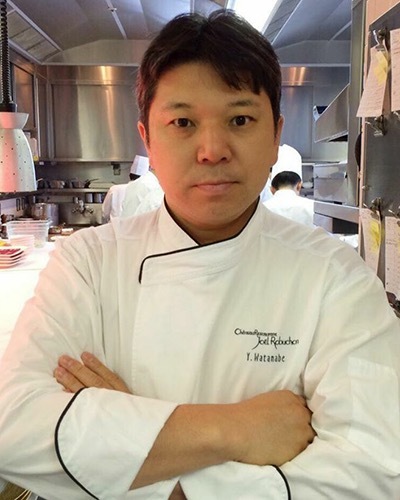 L’Osier was established in Ginza, Tokyo, in 1973, making it one of the oldest French restaurants in Tokyo and a throwback to the nouvelle cuisine era. 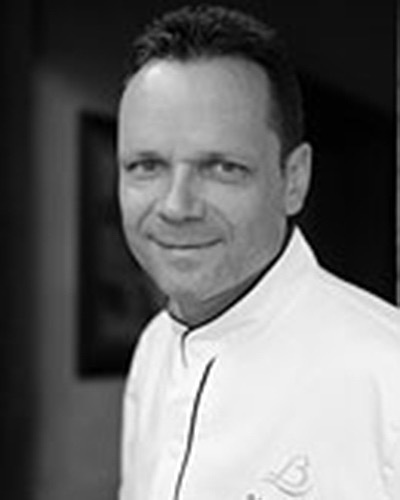 Management recently appointed executive chef Olivier Chaignon to oversee the kitchen, a change that has not had a negative impact on the food. Chaignon has maintained the historically high standards: Every stunningly presented dish is a perfect composition offering layers of mouth-watering flavors. Reviewers often comment about the luxurious space and flawless service. 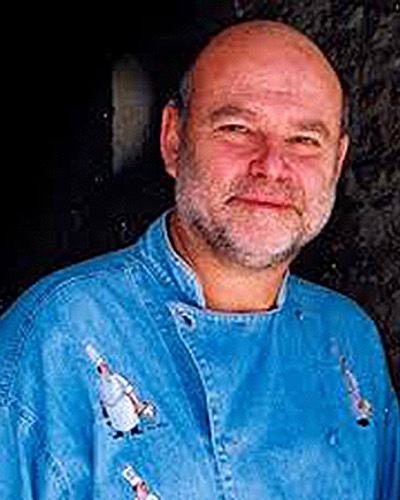 One of the most difficult things for a well-known restaurant to do is to carry on after its founding chef has departed. But this classic house in the northern part of Burgundy has managed to stay the course, even though its namesake passed on back in 2003. Credit Bernard’s ex, Dominique Loiseau, and executive chef, Patrick Bertron – whose menu offers a number of Loiseau’s classic dishes, like frogs’ legs in a purée of garlic with parsley juice, as well as his own creations, such as a filet of Challans duck that he serves with a spiced fig and hibiscus sauce and preserved turnips – for maintaining such a steady hand and keeping the Loiseau brand alive. 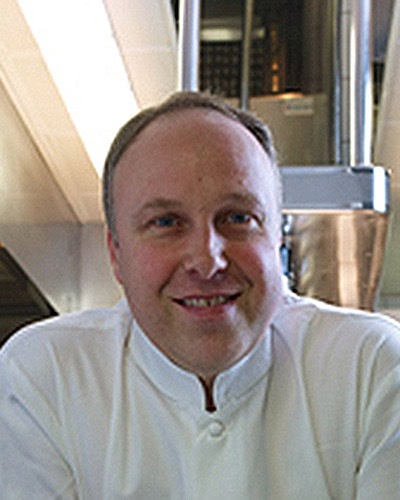 In this restaurant in the Hyatt Regency Tokyo, Michel Troisgros has done an exemplary job of transporting his signature cuisine acidulée from Roanne, France, to Tokyo. The impeccable service allows diners to enjoy long meals without feeling suffocated. The restaurant is perfect for business and casual lunches alike, and is especially wonderful when the sunlight streams through its giant windows. This is a perfect example of what can be achieved when a chef marries nouvelle French cuisine with superior-quality Japanese ingredients. Though it has been open since 1967, it was during the 1980's that the Minchelli brothers who attracted attention to this restaurant. More than thirty years after this restaurant pioneered the concept of nouvelle cuisine fish cookery, Pascal Hélard continues to serve diners “ultra-fresh fish” that includes Belon oysters the size of your fist and house classics like an escalope of monkfish with Vodka butter and the signature homard à l’orange,, a reminder of the days when pairing fish and sweet fruit was thought of as revolutionary. Le Bernardin is a must visit for diners who are looking for a serious French meal based around fish and seafood that are treated with the utmost respect and care. 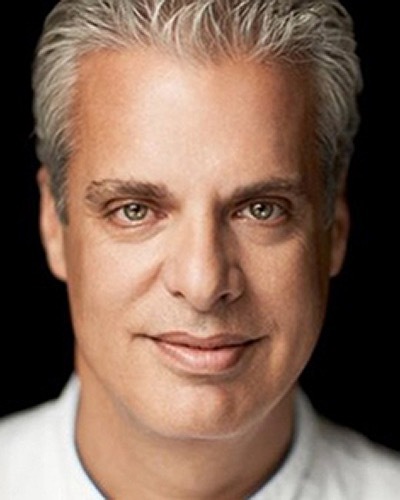 Eric Ripert continues to serve what is called, "hands down the finest, most exquisite seafood served this side of the Atlantic," which arrive at your table in creations that include a progressive tasting of Kumamoto oysters en gelée, sea urchin risotto with toasted nori and a citrus emulsion and a surf 'n' turf of escolar and Kobe beef with eggplant fries, pesto and anchovy sauce. 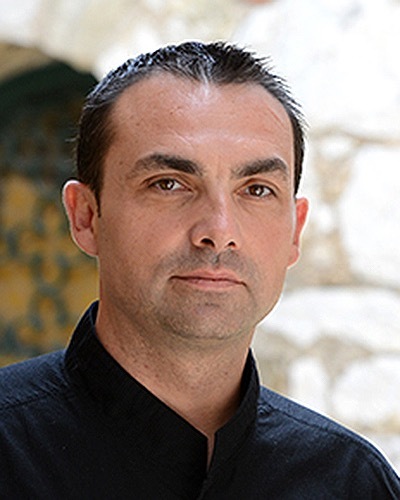 Oenophiles could spend an hour or two poring over award-winning wine director Aldo Sohm's list. The attractive new dining room is the result of the restaurant undergoing a complete renovation back in 2011. Pierre Gagnaire Tokyo, located on the 36th floor of ANA InterContinental Hotel, is no doubt the best of the three Pierre branches in Asia (the other two are in Hong Kong and Seoul). In addition to a gorgeous view from a window table, one can enjoy reinterpretations of legendary Chef Pierre Gagnaire's recipes with the incorporation of pristine local Japanese ingredients and personal touches by Chef Yosuke Akasaka. The dishes here are crafted with precision and perfected through the Japanese spirit of attention to details. 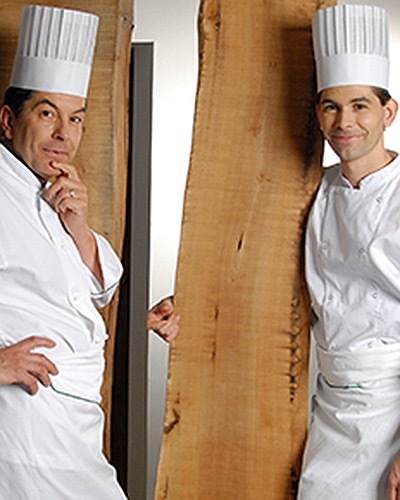 Lunch is reasonably priced, but even dinner is not overly expensive when you consider that you are eating in a hotel with exemplary service and getting a taste of one of the world’s most renowned French chefs without having to fly all the way to Paris. Known for its refined cooking, pleasant service and a charming location along the banks of the Yonne river, Jean-Michel Lorain's restaurant continues to be an important stop over for diners who are traveling along France'sNorth/South autoroute.. A little more than 90 minutes away from Paris, it's close enough for a day trip or a quick overnight stay. Back in 1962, Aimo and Nadia Moroni opened a simple restaurant on a quiet street in a residential section of Milan. 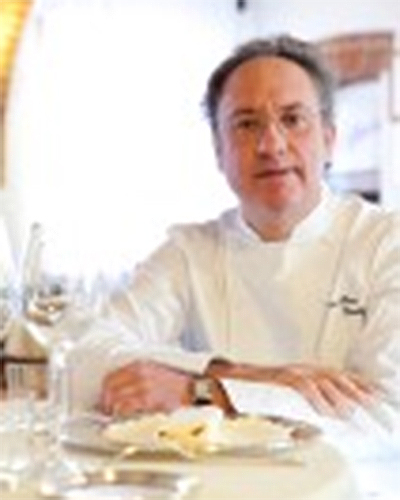 Fifty years later, a dining aficionado no less significant than Michael Tusk, chef of San Francisco's Quince, the highest-rated U.S. Italian restaurant in our 2012 survey, says this remains one of his favorite places to eat in Italy. And with dishes like risotto with Nocellara olive oil, baby squids and their ink, capers and lemon along with smooth and crispy suckling pig from Umbria served with rosemary and apple honey, who could blame him. 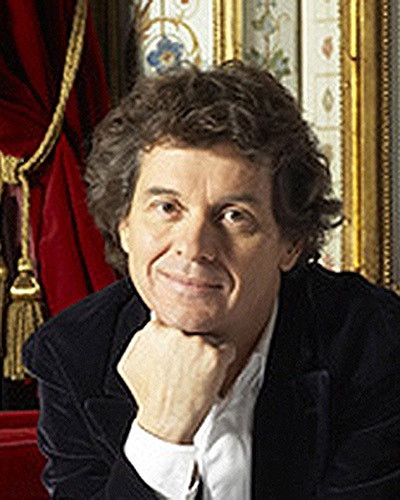 Jean-Claude Vrinat was considered the consummate host. Although he is no longer with us and the restaurant is now owned by the family who operates Chateau Phelan Segur, this restaurant located in a splendid hotel particulier in the center of Paris still offers refined food, a fabulous wine list and what some argue is the best service team in the world. 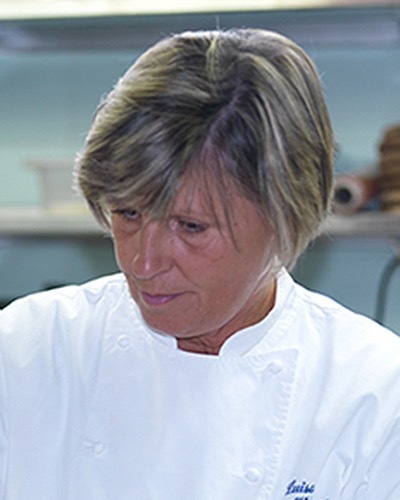 If anyone misses the old Alain Ducasse at the Hotel Plaza Athénée, book a table in this dining room that reviewers describe as “luxurious, opulent and majestic.” The kitchen is lorded over by Jocelyn Herland, who has taken the reins after a successful stint running the kitchen at the Dorchester in London. 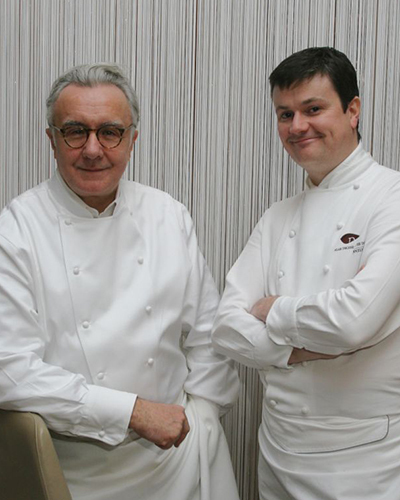 According to a plan devised each day by the Ducasse corporate offices, Herland offers diners such options as the five-course Collection Menu, where a meal consisting of vegetables cooked in a salt crust, sea bream with caviar and beetroot, lobster with Jerusalem artichoke and guinea hen with black truffles weighs in at a whopping 380 euros. 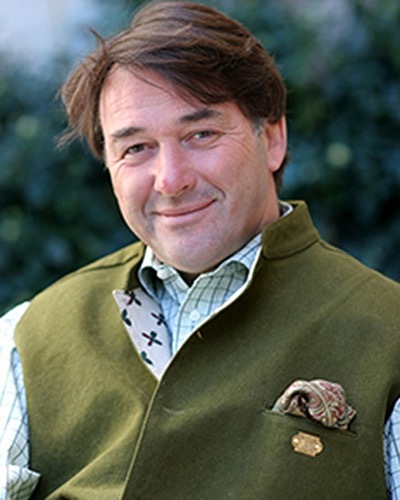 By serving dishes like duck liver with green apple and venison with purple curry and a Port wine sauce, Heinz Winkler was the first chef in Germany to build an international reputation. 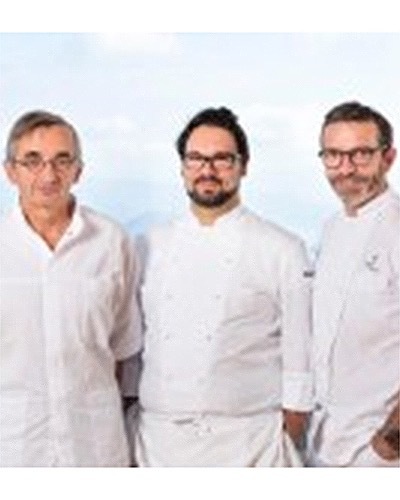 His restaurant, located an hour south of Munich and a similar distance from Salzberg, has remained the premier dining destination in southern Bavaria for more than 20 years. 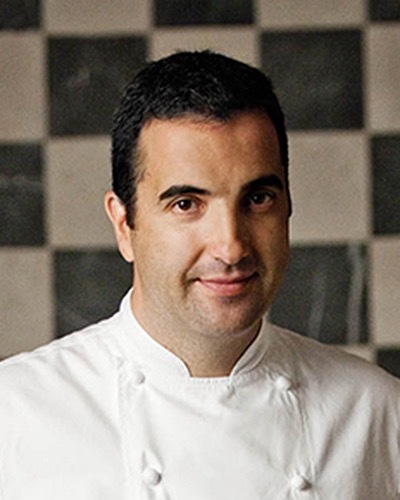 Ever since Breton-born Ronan Kervarrec took over this kitchen in 2010, he has reinvigorated this restaurant, according to our reviewers. Of course, any commentary on this restaurant has to begin with “the fabulous views of the Mediterranean” and the “unbelievable setting,” described as “secluded and romantic.” But reviewers report the cuisine “is every bit as good as the view”; one person said, “Even if you are facing a wall the food can stand on its own.” Kervarrec’s classic French cuisine features dishes like local zucchini served three ways—dressed with orange peel and curry-flavored squash seeds, the flower stuffed with mozzarella and fried in a tempura batter, and crushed with truffles – and red mullet scented with an olive purée and served with a stew of vegetables and almonds. 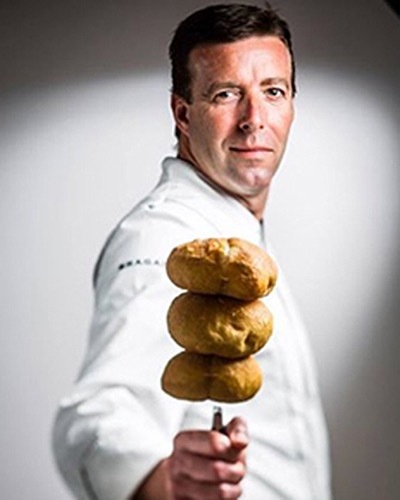 Serving “perfectly executed” dishes based around Irish ingredients, like a glazed fillet of Wicklow lamb, a pressé of game birds and pan-roasted native red deer, Patrick Guilbaud’s restaurant has been the anchor of the Irish haute cuisine movement for the past 33 years. 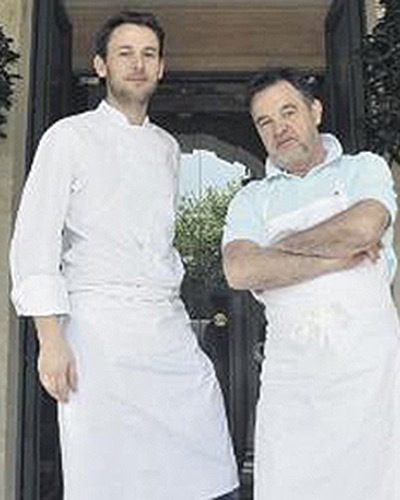 After spending many years cooking at one of France's top restaurants during the era that Gérard Boyer was running the kitchen, Philippe Mille has done a commendable job of filling GérardBoyer’s big shoes at this classic house in Reims that recently celebrated its 30th anniversary. While the list of Champagnes is probably the greatest you will see in your lifetime, it’s important to note that you can use it to wash down dishes like with radish, beets and turnips. Terrines of foie gras, salmon soufflé with Riesling sauce, Bresse chicken with truffles stuffed under its skin and then poached, andbottles of Alsatian wine with some age on them: A leisurely lunch with the Haeberlin family at their charming restaurant by the side of the river Ill remains one of the most enjoyable gastronomic experiences in France. Giancarlo Perbellini’s careful cooking, along with some well-sourced fish and seafood, can be sampled at this elegant restaurant, located in a business park 30 minutes south of Verona. Giancarlo and his wife, Paola, are among the most gracious hosts in Italy. Responsible for carrying the torch lit by his father-in-law, legendary chef Pierre Wynants, Lionel Rigolet continues to meet the high standards that this magnificent art nouveau dining room, located a few hundred yards from Brussels' Grand Place, has always been known for. Don't miss their signature dish of gray shrimp with oysters and a Riesling and potato mousseline. 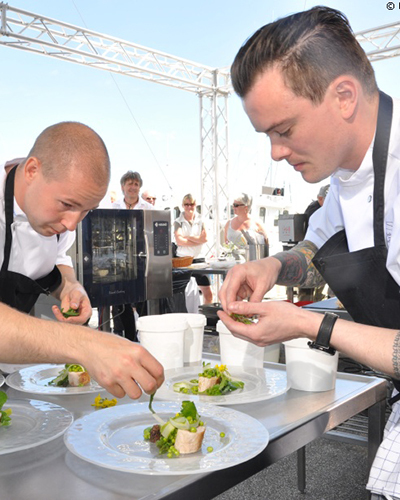 While Noma usually comes first to mind when people think of the Nordic culinary revolution, the underpinnings for the regions culinary ascent actually occurred in 1976, when Lene and Sven Grønlykke opened this restaurant. In fact, René Redzepi was working in the kitchen here before he opened Noma. 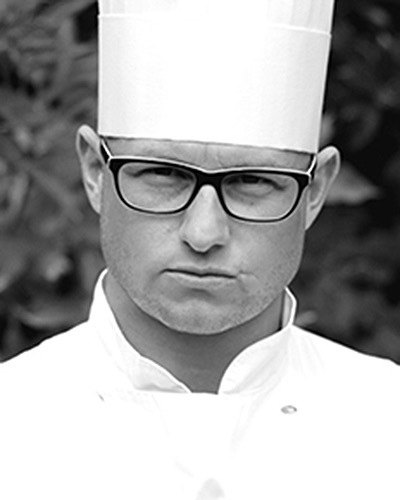 Mark Lundgaard runs the kitchen at Kong Hans Kaelder, and his menu is laced with a French tinge, as seen in dishes such as fresh Norwegian scallops with smoked butter and caviar, Danish black lobster in an onion nage with tomato and artichoke and turbot baked in salt served with its roe, potatoes and a Champagne and mussel sauce. 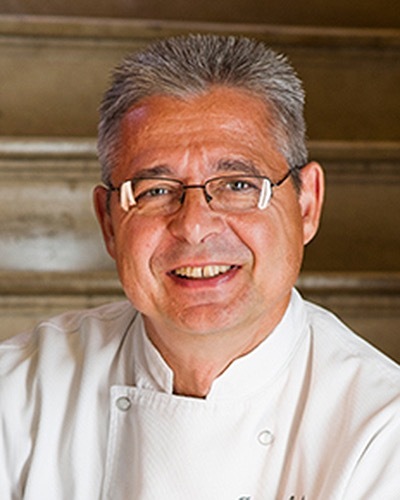 The building that houses this restaurant-a mansion that was once the residence of Raymond VII, count of Toulouse-is where one of the deans of French cooking, Michel Trama, has been serving a contemporary version of his native Gascon cuisine for the past 35 years. 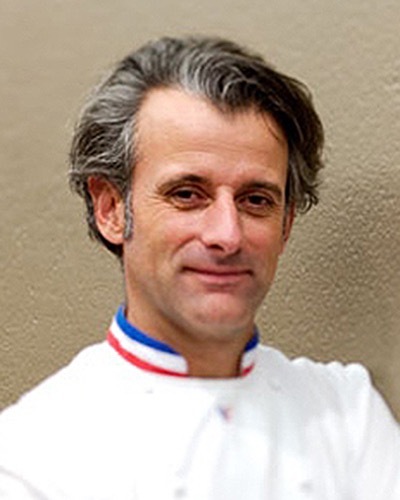 In the '80s and '90s, when it was located in the 17th arrondissement on the Avenue Villers, Jean-Pierre Vigato's restaurant was popular among both local and international diners. 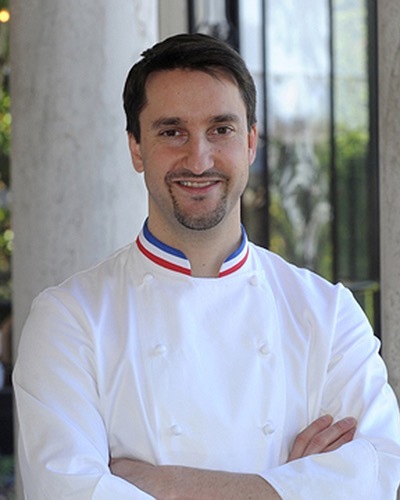 After a bit of a down period, interest in his cooking has been rekindled since he moved the restaurant to an exquisite mansion off the Champs-Elysées. 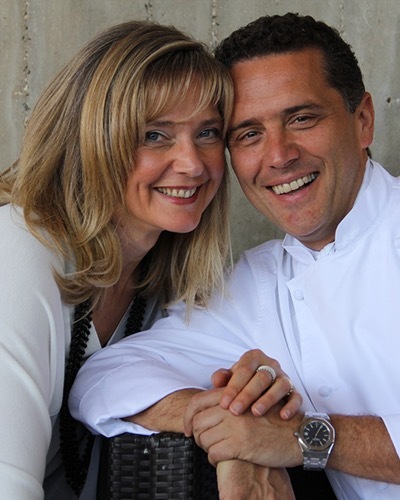 Luisa and Angelo Vallaza's low-key place is not as well known or as flashy as some of the more famous restaurants in Italy, but you will find fabulous cooking and top-class ingredients at this restaurant located just south 45 minutes east of Lake Maggiore. The wine list contains numerous majestic bottles from every region of Italy, but most of all from the restaurant's own Piedmont region. 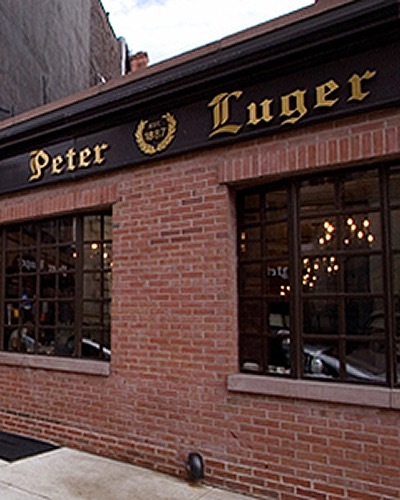 When it comes to places to eat corn-fed beef, anyone who tells you they know of a steakhouse in New York City that is serving better steak than Peter Luger doesn't know what they are talking about. That’s because whenever a shipment of short loins arrives at any of the top meat wholesalers in town, Luger’s is given "first pick," meaning that their buyer is allowed to walk through the wholesaler's cold box and choose the ones that look the best before the competition does the same. In addition to the "ethereal porterhouse steaks," the menu offers quirky starters and side dishes, and one of the city's best hamburgers, made from the trimmings of 28-day-aged steaks and priced at an über-bargain $9.50, is available at lunch. 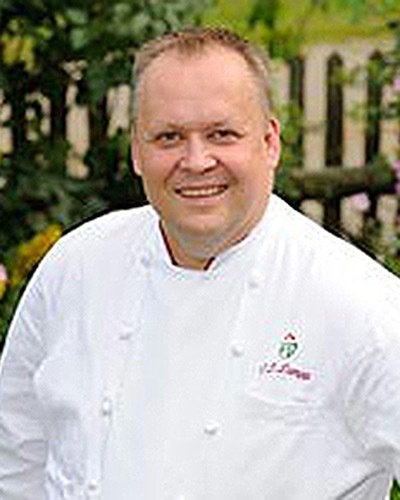 Those in the U.K. who are looking to recreate the type of regional dining experience that is common in France, where a chef and his family run a restaurant in a renovated chateau, should visit Raymond Blanc, "the dean of French cuisine in Britain," at this lovely manor house outside Oxford, where they raise their own produce and serve dishes like veal kidney, alliums, lovage and red wine jus. One of the most classic houses in Belgium. 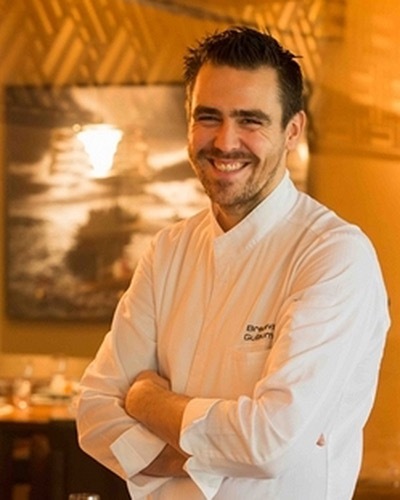 Dishes like roasted French scallops with leek; sea urchin and cream with seaweed; and "Sole meunière," with Belgian endive and sabayon with lemon grass show that Geert van Hecke knows how to take advantage of the wonderful products from the nearby North Sea. With a location 30 minutes west of Alba, Gian Piero Vivalda's restaurant is not as well-known as it would be if it were in the heart of truffle country. But there is no doubt in our mind that the restaurant is a must visit for anyone looking for an authentic Italian regional experience filled with high-quality ingredients and careful cooking. If you go during truffle season, try not to miss the house signature fonduta, topped with what seem like endless shavings of white truffle. Most people travel to Baiersbronn, a charming spa town in the heart of Germany’s Black Forest, in order to take the cure. But we wonder: After spending a day slimming down at the spa, how many people have supped at this elegant restaurant and thrown it all away on a dinner of foie gras with pears and port, followed by some braised veal of suckling calf with celeriac foam, organic egg and Perigord truffle? If that describes your visit to the town, we will understand if you want to lay the blame for the whole affair on Claus-Peter Lumpp, whose refined cooking harks back to a time when it was commonplace for men to wear a coat and tie for dinner, and when the notion of pampering meant a grueling schedule of workouts, mineral baths and massages by day, followed by a bottle of Champagne and thinly sliced scallops topped with Ossetra caviar at night. Le Grand Véfour is set alongside the gardens of the Grand Palais, and when it opened in 1794, it was the first example of a formal French restaurant. Today a visit affords diners the opportunity to enjoy Guy Martin's vegetable-oriented cooking while sitting on cushions once warmed by the likes of Napoleon and Victor Hugo. Though it doesn't have the same vaunted reputation as the more famous Elkano, which is run by cousins, diners looking for prime specimens of fish like turbot, hake and tuna should consider this classic asador facing the port in Getaria. 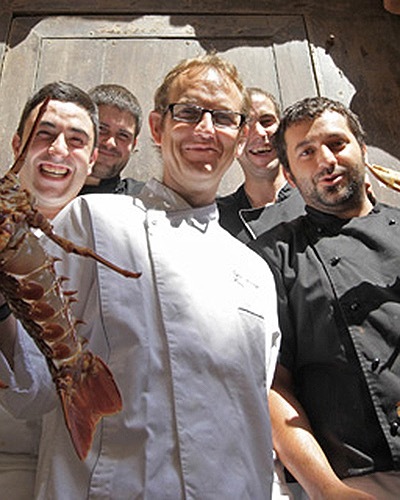 You can wash the tasty fish down with a bottle from one of the best cellars of old Rioja in the Basque region. 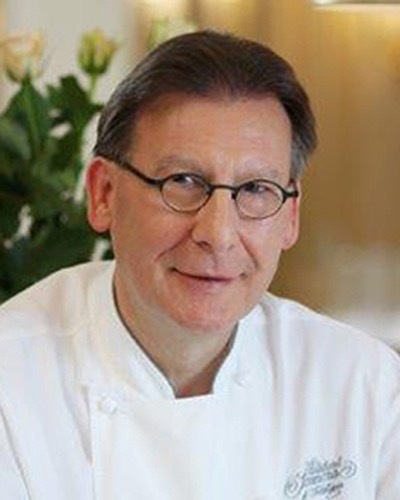 The opening of Tantris in 1971 marked the beginning of the German Küchenwunder, a movement that changed the evolution of German high-end cuisine. 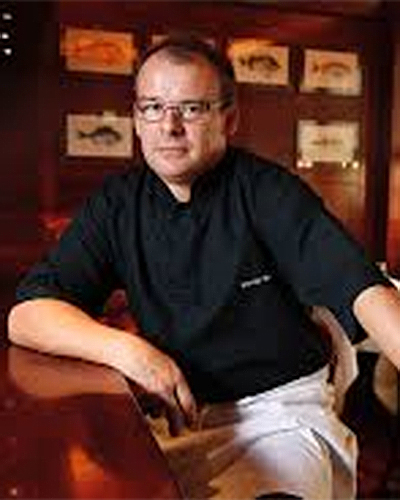 The current chef, Hans Haas, offers straightforward, delicate creations in which no element is redundant. The restaurant's1970s-style interior, beautifully preserved, is considered holy ground by the German dining community. 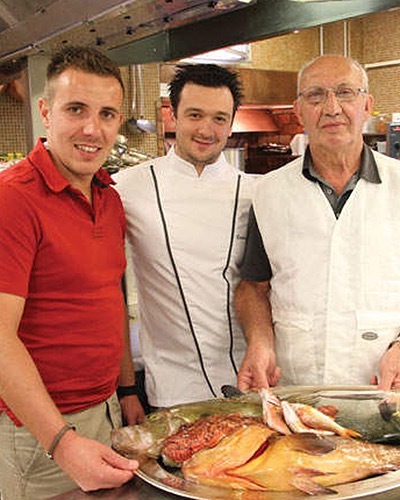 If you are looking to eat fish that is so fresh that it has never touched ice, reserve a table at this restaurant, where the fish the Sordello family serve only come from local waters. This is also where you will find the most refined version of bouillabaisse on the coast. 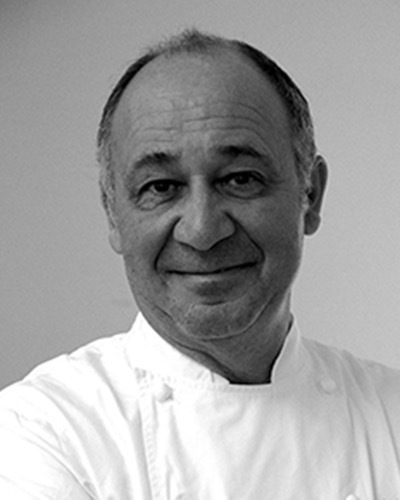 Joceleyn Herland leads a team that utilizes the Alain Ducasse playbook to create one of the most refined dining experiences in London. May we add that the posh location in the Dorchester Hotel certainly doesn't hurt the overall experience? Perfect for business or to celebrate a special occasion, especially on a nice day at lunch when the sun flows into the room from the large windows overlooking Hyde Park. 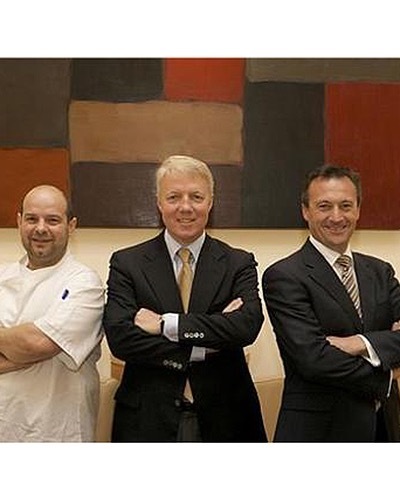 It is rare when a restaurant so closely associated with its founder survives a complete changing of the guard. That task can be even more daunting when the founder in question is the iconic Eugénie Brazier. Mathieu Viannay managed to overcome those odds, and after a period of years in which this classic house fell into decline, he has restored it to its former status. At the heart of Viannay’s success are his “gentle twists on the classics of French cuisine,” and his versions of Lyonnais stalwarts like poularde demi-deuil and lièvre à la royale “are so good that Viannay has created one of the rare occasions where both classical and modern food lovers will be in agreement.” One reviewer described Viannay as “a terrific ambassador for the cuisine of Lyon” – high praise indeed, given that the city’s culinary history is replete with chefs the likes of Paul Bocuse and Alain Chapel. With the iconic Can Fabes now shuttered, those who want to reminisce about the late Santi Santamaria’s cooking can do so at this beautiful restaurant in the Hotel Hesperia Madrid, where his influence can be felt in dishes like roasted Figueras’ onions with cockles, apples and celery. 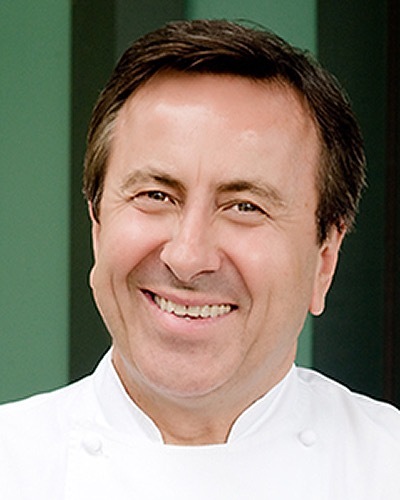 While Daniel Boulud’s cuisine has the reputation of being traditional French, it is actually far more modern than people realize. Dishes like Louisiana shrimp with Ibérico ham and a tasting of melons or halibut baked on Himalayan rock salt with curried yogurt and Thai basil are in the same vein as what you would find at top contemporary restaurants in Paris today. While the dishes can be innovative, the experience contains the sort of fussy, fawning service that is geared towards a combination of socialites, visiting dignitaries, Upper East Side families commemorating special occasions, a celebrity or three and out-of-towners who want to dress up for a fancy night out. The wine list is “out of this world”, complete with out of this world prices. 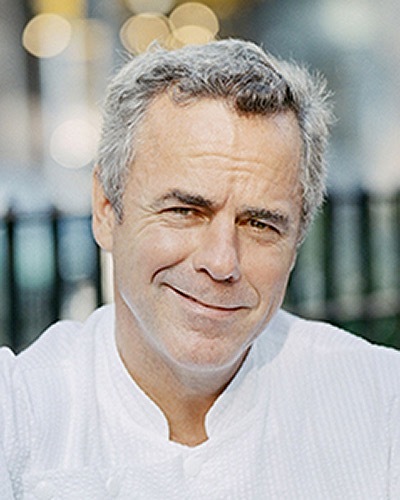 David Bouley is responsible for a number of firsts. 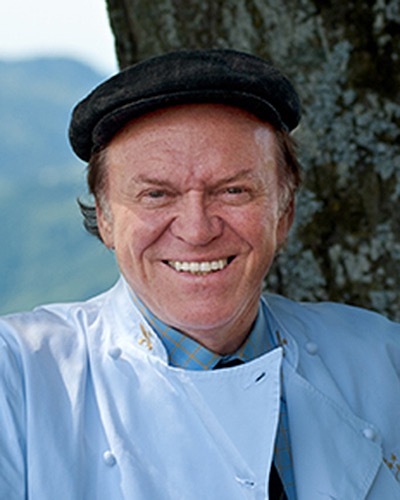 He was the first American chef to utilize natural sauces made from fresh fruits and vegetables in his cuisine, the first to cook fish with the proficiency of the chefs from the Basque region of Spain, and the first to incorporate Japanese and American cuisine in a way that wasn’t fusion. 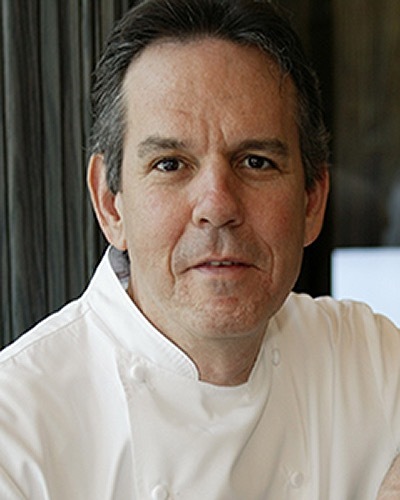 And if that isn’t enough for you, the number of great young chefs who have come out of his kitchen are almost too numerous to count, and include the likes of Blue Hill’s Dan Barber and Brooklyn Fare’s César Ramirez's. 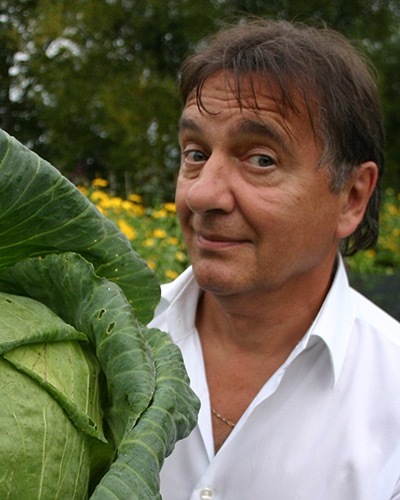 But maybe the most impressive thing about David is that after 25 years, his cooking isn’t dated and he remains one of the country’s greatest chefs. Forty-four years is a long time. But it was 1972 when Giorgio Pinchiorri and Annie Féolde opened this restaurant in a converted palace that dates back to the 1800s. 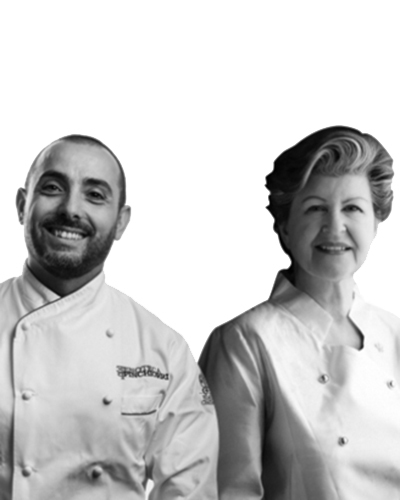 These days you will find the duo greeting guests in the dining room, while the capable Ricardo Monco has assumed the cooking duties from Féolde. 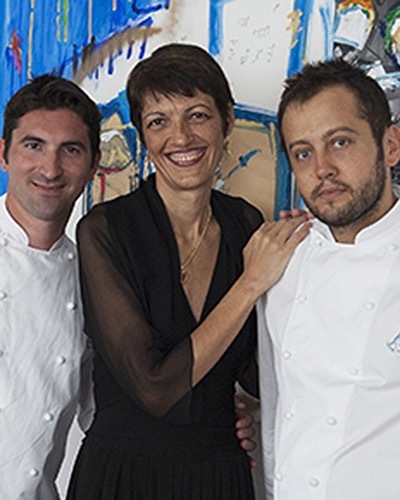 Monco has maintained the restaurant’s tradition of serving a Frenchified version of Italian cuisine that includes dishes such as an escalope of foie gras with fruit, vegetables and Amaretto and Mora Romagnola pork with spiced salsify. You can’t mention the restaurant without noting that it has one of the world’s greatest wine cellars, featuring numerous offerings from every country in the world.